fingers polish mania: It's #100! So have you recovered from last post's horror? Do you need therapy? Well that's what I'm here for! If you are not already a follower, you need to be! For today's mani, I wanted to do some more Bettina. 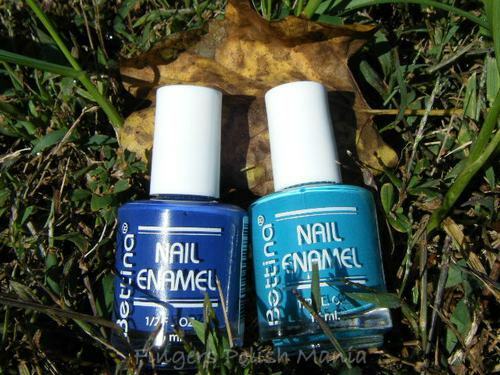 This is a lovely polish brand from Puerto Rico. I have not yet tried all the colors I own. I also wanted to point out that this is my 100th post! How freakin cool is that? Back when I started, I had no idea what I was getting myself into. I have met so many awesome people from around the world. Have tried many polish brands from other countries. 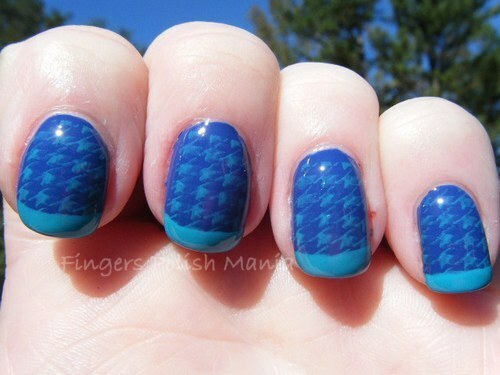 And I am loving this nail polish fanatic community. Another blog I follow hit 500 posts recently-someday that will be me! Now on to the polish. Here we have my silly bottle shot. I even got a fall leaf in there! On the left we have Bettina Jeans Premium Wash, and Aqua on the right. My camera is messing with these colors again. The JPW is more periwinkle and darker, the Aqua has more green in it. So frustrating!! The formula on these were spot on as usual. I really had minimal clean up. Here are your indoor and outdoor shots. It really is a pretty periwinkle blue. This is not showing it's true beauty. I am loving that blue sky in the background. Just so pretty this time of year. Using Aqua, I stamped with plate BM 19 and did my funky french. I think this is my favorite stamp so far. 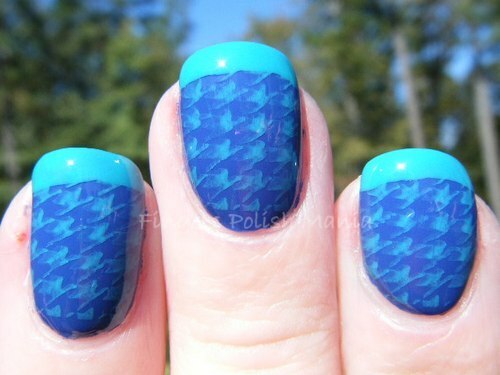 I just love this pattern and want to try it out on different colors. Again, the indoor and outdoor shots. Aren't these two blues lovely together? I am so loving this pattern and this look. The Bettina brand really knows how to do cremes! Oh yeah, I love me some cremes!! Don't forget to enter my giveaway-you have until the 28th! !